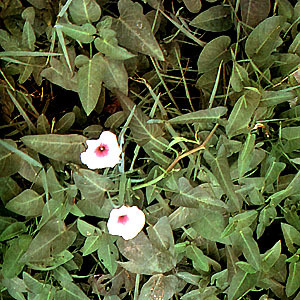 A smooth, widely spreading vine, with the stems trailing on mud or floating on water. Leaves are oblong-ovatem 7-14 cm long, with a pointed tip and heart- or arrow-shaped base, long petiole, the margins entire or angular, and sub-lobed. The peduncles are erect, 2.5 to 5 cm long, with 1 or 2 flowers in the axis of the leaves. Sepals are green, oblong, about 8 mm. The corolla is narrowly bell-shaped, about 5 mm long, and purplish with the tube deeper purple inside. Throughout the Philippines in stagnant streams, fresh-water swamps, and pools. Young leaves and stems eaten as a leafy vegetable. Young stems popular as achara (native pickles) ingredient. Good sources of iron, calcium, vitamins B and C.
Tops are mildly laxative. The purplish variety used for diabetes because of assumed insulin-like principle it contains. Juice used as emetic. Dried latex is purgative. Poultice of buds used for ringworm. This entry was posted in List of Medicinal Plants in the Philippines and tagged kang kong, swamp cabbage on February 24, 2009 by Pinoy Herbs. ders no imformation about d uses of ds herbal medicine…..
hi, your website is great. it gives me good information on the good aspects of our medicinal plants. indicating the bad aspects of all our medicinal plants will be a rich source of knowledge for all. this way, one can be careful or can avoid eating that plant, and go to another medicinal plant as its substiture. Does it grow in India? Is anybody familiar with the Himag tree which can be found only in certain parts of the Philippines? It is supposed to be very effective against many serious illness. Kangkong (Potato Vine, Swamp Cabbage) was the most abundant especially in the ares where people has difficulty in living. A very delicious plant which compose of many Vitamins and Minerals. Most poor people eat it because they can afford it. Also, it can be eaten by rich people.